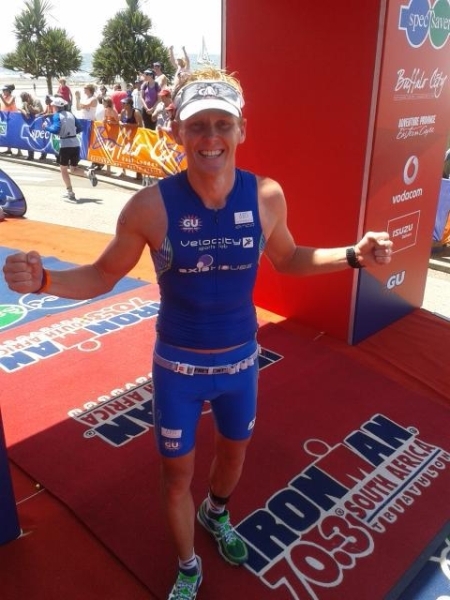 My lead up to Ironman 70.3 was fantastic, I did everything right; meaning focusing on recovery, stretching, massage and thats what can separate you from your competition. 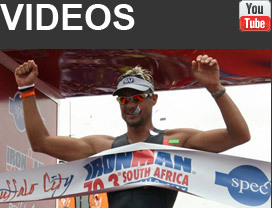 The last fews days leading up to 70.3 I was relaxed and calm, knowing I was in fantastic shape. In the back of my mind I knew I had put all the hard work in and now it was time to smash it. Raynard's program suited me so well, there were some highs and lows, good days and very bad days, but getting through those low times makes you the athlete you are on the day when you cross the finish line. Race morning started with a 4am wake up call which allowed me to do some dynamic stretching and think about my game plan. I had a look at the weather which seemed to be a bit breezy and decided to change my Tri spoke to my zipp 404. I got down to breakfast and saw Raynard who said don't worry about it stay with the tri spoke so not to add any more stress. I thought right, he knows best I will listen to Ray. I arrived at T1 with enough time to check things through, pump tyres put my water bottles on my bike and make sure everything was smooth. I changed into my wetsuit, did some swim technique drills for stretching which Natalie Tissink said I should do before getting in the water :) and went for a 10min warm up swim. I then stood at the waters edge for about 10min looking out at the ocean and something was so positive in the back of my mind that I was going to do very well. I lined up for my wave at 7am and walked/ran to the start line making sure to get in the right place in the front of the pack without stressing out. 3 2 1... The gun fired! Running in as fast as a could to not lose any fast swimmers, I went out swimming as fast as I could to the 1st bouy- WOW I'm in front, awesome stuff...Then I got into a good stroke, one I knew I was capable of swimming for the whole 1.9km's. I had someone swimming on my feet for most of the swim which was fine. I knew I had to relax and focus on my own race and the speed I am used to. With 500 meters to go my goggles filled up with water, I managed to swim about 2 mins like that then decided to dust them so I swam the last 300 meters without goggles. I Ran up to the beach in 1st place looking at my watch reading 26min something, RESULT! I came out T1 with everything going right and as soon as I was on my bike something just said GO :) The start out of town wasn't too hard cause I knew I had a few climbs to do in the first 25k's and took it at a medium comfortable pace. I was passing most of the 18-29's and making up huge ground on the climbs which are my strong point. I got to the turn around point at 45km in around 1.15 and knew that I was on target on my race strategy. On the way back to town it was a bit windy but I just put my head down (like a Sebastian Kienle style) and was flying, hanging on for dear life. I had caught everyone but 3 of the 18-29's coming into T2, as I entered the tent I saw them run out and thought to myself I gotcha!! My run was fantastic, I had some fresh legs starting the run and was in good form. My leg turn over from all the track sessions felt great and knew just to take it easy climbing Bunkers Hill. On the last lap with 8k's to go I felt the wheels coming off a bit going up Bunkers but I still managed to maintain a good pace. With 1km to go I swithed my Garmin to Multi sport time and I couldn't believe my eyes 4:13 I was shocked with so much exitement and joy that I started to claim my victory of smashing the amatuer record by a whole 12min. I had Trevor screaming for me from Velocity Sports Lab, I had Marc and Rebecca from GU going nuts and of course my wonderful coach Raynard Tissink standing at the end on the red carpet announcing my name as I came in. My arms were reaching for the sky giving the old fist pumps to the crowd and crossing the finish line. What an amazing race. Before the race I was hoping for a 4:20 but to better that time by 3 mins was fantastic. My girlfriend was there at the end who has been so special to me for the past 4 years getting me in the best shape possible with all the massages and making all the correct food and putting up with all my crap :) My mom was there and my step dad and seeing there faces made me so happy with what I had just achieved. After that a person from the Anti Doping team called me to get tested and off I went to celebrate my race in doping control-NICE!!! Trevor the man that has made my dream come true and main sponsor Velocity Sports Lab and Axis House came to congatulate me in the anti doping tent, he was so happy with my race result. I was overjoyed to pull out an achivement like that in front of my sponsors and coach, it is so awesome to be sponsored, but to deal with the pressure knowing you have to prove yourself is one hell of a thing! Please visit the Raynard Tissink coaching academy and sign up ASAP, train hard and maybe you will be standing on the podium one day and going to Kona.